The State of Zelda In 2013: Finally Escaping Ocarina's Shadow? A gaming series that's been around for a quarter of a century winds up in a predicament. Change? Or don't change? There's only one answer, of course. Classic games are not classic music albums or classic novels. The audience for a great old game isn't satisfied with reprints. They'd like a sequel, please. A little bit of the familiar. A little bit of the different. Last week, we saw more of what Nintendo has coming next with their Zelda series. At first glance, you might think they're tilting toward the familiar. They announced a sequel to one of the most loved Zelda games of all time, after all. And if you think that they're tilting to the familiar—it's a reasonable assumption based on the facts—you might think they're tilting into trouble. Zelda's one of those series that has been digging a rut of late. Too much of the same stuff. Theoretically in need of a shake-up. What we saw last week wasn't a shake-up. Or was it? I've got a theory about this new game. It's all about the series finally escaping the long shadow of the most revered Zelda ever made. That would be Ocarina of Time, the game one of its lead creators—and the man who oversees the creation of all Zeldas—has said the series has never surpassed. While there are theories that the games are all narratively connected, the series more or less is presented as a sprawling set of mostly-standalone adventures, a mix of puzzle-solving, combat and exploration featuring an elf-eared boy in green. His name is Link, and he is always trying to save a princess and/or save a kingdom. There's a new Zelda just about every other year. Zelda's been in decline lately. The games are still very good, but they don't define a generation or a console the way they used to. That's a reasonable drop from freakish stratospheric achievement to "mere" consistent high quality. The first game in the series, 1986/7's The Legend of Zelda, was a system-seller on the original Nintendo. Five years later, The Legend of Zelda: A Link to the Past was for the Super Nintendo. In 1998, the Nintendo 64's The Legend of Zelda: The Ocarina of Time was all that and more—hailed as, possibly, the greatest video game ever made (I still think Tetris earns that, though my own taste is for the N64's other Zelda, Majora's Mask). The GameCube's Zelda, The Wind Waker, released in 2002/3 is regarded by some as one of the best-looking games ever. Mingling with the games above, the several portable Zeldas on Game Boy, Game Boy Advance and Nintendo DS earned acclaim of their own, though only the first one of that line is widely considered an all-time great. The rest are merely very good games. Also "merely" good were the pair of most recent console Zelda games, the Wii/GameCube Twilight Princess and last year's Wii-only Skyward Sword. Those last two, good as they are, exemplify the Zelda series' recent decline. Previous console Zeldas were top Game of the Year contenders by fans and critics; those last two, for anyone who owned more than just a Nintendo system, were not. The past decades' worth of Zeldas are almost all clearly descended from Ocarina of Time. They primarily play in three dimensions, typically give Link an Ocarina-style mode of conveyance, a musical instrument, and a dungeon-filled world to explore in a specific order. Ocarina's a great game, but its influence feels lopped on top of a series that already had a set formula—albeit one that allowed the deviations I had described in my Skyward Sword review. In all recent games, Nintendo has stuck not just with those Ocarina traits but with the formula established in the first decade: the need to grab a shield and a sword, to track down bombs and boomerangs, an item per dungeon. It has seemed, to me, to be suffocating. So I've regularly been asking Nintendo about it, even as I've enjoyed some of the experiments made within it, like the Zelda-with-trains Spirit Tracks. Last week, at least, we got one sign that the series could be finally stepping out of the long shadow of its most acclaimed game. "With a game, it's all about developing — developing the character, developing the player's skills, developing the story," [Aonuma] said. "In that sense it is necessary ... but it doesn't have to be that way. I'm always thinking of new ways to approach it." Does that mean he sees a day when players won't have to go through the same early motions game after game? "I guess there's a part of me that would like everyone to have a variety of items and a variety of abilities available to them in the very beginning, but because there is such a wide variety of users' skill sets out there, I want as many people as possible to be able to play. And in order to give that kind of accessibility, it's better to start small." The Zeldas that followed—Phantom Hourglass, Spirit Tracks and Skyward Sword—all started small, as it seemed Aonuma believed they should. Maybe they will continue to. Maybe all that bomb and arrow collecting is a must. So what could they chuck? How about they chuck Ocarina of Time? That's the change, after all. The new Zelda that Nintendo is making for the Nintendo 3DS—this successor to A Link to the Past—is the first major Zelda in eight years that is not descended from Ocarina of Time or its successors. It's descended from not just a pre-Ocarina game but from a pre-Aonuma game. It's descended from a game that was never in 3D, from one that arguably spawned Ocarina itself. At a glance it might seem too loyal to the original A Link to the Past. It's in the same world, on the same map. Happily, it adds a twist. The game's hero, Link, can turn into a drawing and travel, as a drawing, across flat surfaces. It explores another dimension, in its own way. Perhaps we can think of it as an alternate successor to Link to the Past—as an alternate-universe Ocarina of Time. Perhaps it therefore will unlearn some of the lessons of Ocarina and shake some of the influence of that towering game. Before Ocarina, Zelda games avoided lengthy playable pre-amble. The games were more mysterious, more packed with surprises, more dependent on the exchange of information between gamers to suss out their secrets. Before Ocarina, Zelda games were the Dark/Demon's Souls of their day. Might long-time Zelda fans dare hope for a return to that? Ocarina of Time notoriously added a nagging helper character, Navi, and Zelda games have been holding players' hands ever since. Perhaps a leap to that Link to the Past is a leap to a more intriguingly vexing style of Zelda game. (Or they're just using the same overworld and I'm getting old-timers' hopes up for no reason!). My colleague Jason Schreier argues that the break from Ocarina I believe I'm seeing now isn't as dramatic as I think it is. He argues that the two DS Zeldas, 2007 and 2009's Phantom Hourglass and Spirit Tracks, already deviated from Ocarina because they, like A Link to the Past and 2004's Game Boy Advance Zelda, The Minish Cap were Zelda adventures played mostly from an overhead perspective. Well, they were in their dungeons, at least. But, having played all of these games I've mentioned in this piece, I feel those recent DS Zeldas still aimed to emulate Ocarina, still aimed to look and feel like a big 3D Zelda adventure whenever possible, still cribbed from the N64 game's world design and still played with the handholding and the throat-clearing we've seen in most post-Ocarina Zelda games, not with the efficiency and obscurity of the more streamlined and mysterious A Link to The Past (and the two NES Zeldas before it). Before Ocarina of Time, Zelda games were more mysterious, more packed with surprises, more dependent on the exchange of information between gamers to suss out their secrets. They were the Dark/Demon's Souls of their day. About a year ago, I asked Nintendo's top game designer, Shigeru Miyamoto about some of the challenges his company's long-time series were facing. We talked about how much simpler Nintendo's early Zelda and Mario games were, how much quicker they were to engage players and how they trusted their players to learn them without taking them through extended training sessions. Miyamoto might be one of the only creative people at Nintendo who outranks Zelda-steward Aonuma, so what he's interested in counts for a lot at the company. I asked him: "The theory that began to be developed in this particular article was that these games can become a lot of fun—I finished Skyward Sword and thought it was fantastic—but there might be an issue there that a lot of video games from Nintendo and others take much longer to be fun and to get into than a lot of others. And then I think about Angry Birds. That's fun within seconds. Have you noticed that is at all an issue? Is that something you've noticed that some games take a long time to become fun? Is that a problem with modern games?" "This is actually a topic that has been a big discussion internally for us lately," [Miyamoto] said. "I think there a couple of things going on. One is that, often times we're creating games where you're doing a lot of different actions. Zelda is an example of one of those. And, particularly with these types of games, you have to first learn the action and then you have to master the action and then you have to have more actions added in and master those. Then, when you have a lot of actions you can do all at once is when the game really becomes fun. And with a game like Zelda, on top of that, you have the story elements that also take additional time to tell. "So one of the things we're talking about internally is how can we get people to that point of fun more quickly, and 'How do we balance the need to teach them how to do something with the need for them to be able to master it and feel they can do it well? '—and also tell the story—and 'What is that overall balance and how we approach it?' That's one of the key things we're talking about with Zelda right now." This made sense to me, but there was just one problem. The first Super Mario Bros. and the first Zelda had no tutorial text. Their fun started right away. "Is it something that was more natural back then that you guys got away from?" I asked. "Is that what you're saying that you want to go back to that?" "That's the exact topic that we're discussing," Miyamoto said. Nintendo is currently working on three Zelda games. At least, three. That's what they've announced. ...and a new, original game for Wii U. Is that a line-up the promises the series' former knack for consistently radical innovation? Or is that one that is safely still flowing from Ocarina? It could go either way, huh? Last week, Nintendo of America's Bill Trinen told my colleague Kirk Hamilton that Nintendo's three Zelda games are made by the company's large Zelda team. "They kind of shuffle people in and out, so they'll sort of have their core group, but then they're bringing new people in and out, so that helps bring in fresh ideas," he said. "Each of the different games will have their main lead director, or maybe depending on the game, they may have two...Generally the way that the Zelda team operates is they may have one or two people who carry over or take the lead, but they do a lot of kind of jumping in and out in terms of moving from handheld to console, or vice-versa." It's all a bit of a black box from the outside. It's hard to decipher how much change they think they need to make or how much the series really needs. 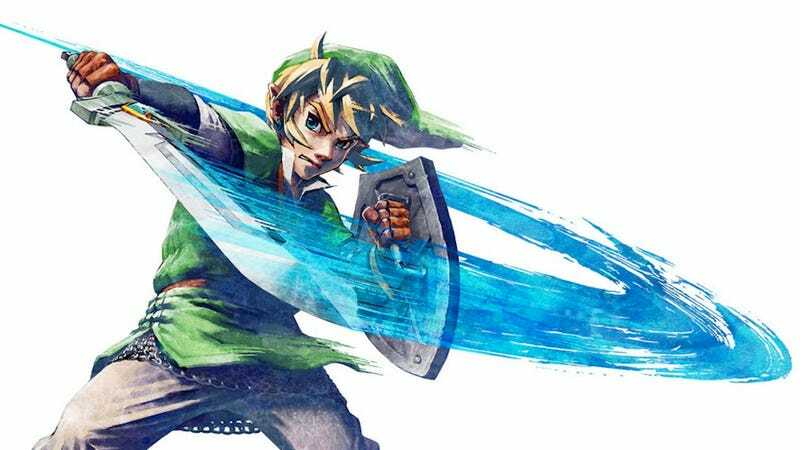 It's possible that these next three Zelda games encompass the range of options of what Aonuma's crew can take: a sequel, a remake and, perhaps, something entirely original. E3 will hopefully bring news of that last one. Things will look different if that new one is—pure speculation by me—designed for multiplayer, the first Zelda with that focus since Four Swords Adventures. Or what if it's a sidescroller? Or first-person? Or set in the future? Who knows! Zelda's in an odd spot right now. Last week, at least, we got one sign that the series could be finally stepping out of the long shadow of its most acclaimed game. Even if it's doing so to step into the shadow of its second-most-acclaimed, that's a change—the biggest change to Zelda in a long time. That's refreshing. How much more change does Zelda need?